A tumultuous adventure into the wilderness of the human mind and personal frailties, Suddenly, Last Summer is an acting and writing showcase. The Tennessee Williams play is transformed into a compelling screen drama, with Katharine Hepburn and Elizabeth Taylor delving into different dimensions of dark madness. In New Orleans, Doctor John Cukrowicz (Montgomery Clift) is a brain surgeon specializing in performing lobotomies for mental patients at a struggling public hospital, run by Dr. Lawrence Hockstader (Albert Dekker). Rich widow Violet Venable (Katharine Hepburn) contacts the hospital and promises to donate a large sum to help expand the hospital's facilities. In return, she wants Cukrowicz to perform a lobotomy on her niece Catherine Holly (Elizabeth Taylor). Catherine has been deemed insane since the death of Violet's son, the brilliant poet Sebastian Venable. He died suddenly, last summer, while on a trip to Europe with Catherine. Upon meeting the distressed Catherine, Cukrowicz senses that there is more to the story than Violet is letting on, and he gets more suspicious when he meets Catherine's mother Grace (Mercedes McCambridge) and brother George (Gary Raymond). They have also been promised money by Violet, but only after Catherine undergoes the lobotomy. Cukrowicz delves into the story of the enigmatic Sebastian, and slowly uncovers a complex web of deep-seated psychological issues linking the troubled poet to his mother and niece. A talkfest constructed from long conversational threads, the Gore Vidal screenplay draws power from epic one-on-one interactions, primarily a long scene between Cukrowicz and Violet followed by another prolonged exchange between Cukrowicz and Catherine. 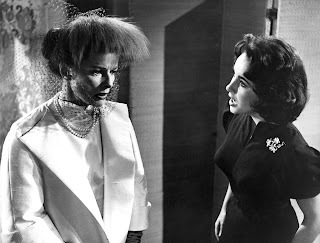 Suddenly, Last Summer is safe in the hands of two master actresses in Katharine Hepburn and Elizabeth Taylor. Taylor haunts the screen while visibly fighting internal demons, while Hepburn majestically dominates through detached - and oblivious - superiority. Together, they make Suddenly, Last Summer a captivating viewing experience. The two trade scenes of emotional maze navigation, stepping through minefields of lies, self-deception, self-preservation and a desperate need to understand a grey world. With Sebastian's death Hepburn's Violet has lost her one anchor in life, but it will take her a while to realize how far adrift she is, and why. Meanwhile, Catherine has been a forced witness to an event that she wanted no part of, and it's aftershocks are still reverberating in her psyche, being mistaken for madness. Montgomert Clift does his best to keep up with Hepburn and Taylor. Suffering from the severe real-life after effects of a car crash, Clift's role as Dr. Cukrowicz is mainly to ask, on behalf of the audience, the questions that will reveal the mystery surrounding Catherine's condition, and to avoid rushing her to the surgery table despite everyone else insisting that he does so. And the answers to Cukrowicz's questions raise enough tortured themes about the human condition to keep psychiatrists occupied for years. The travails of homosexuality, mother-son obsession, lust, self-aggrandization, and co-dependency hide in the layers of emotional carnage patiently unpeeled by director Joseph L. Mankiewicz. The narrative coils its way towards a climax with the entire cast gathered in the primordial garden at Violet's house to hear Catherine's version of events, last summer, leading up to Sebastian's death, a soliloquy that ravages the lives of all present, and redefines who is and who is not descending into madness. Sebastian Venable may have died Suddenly, Last Summer, but the suffering started long before his death, and the damage continued plundering his family long afterwards.